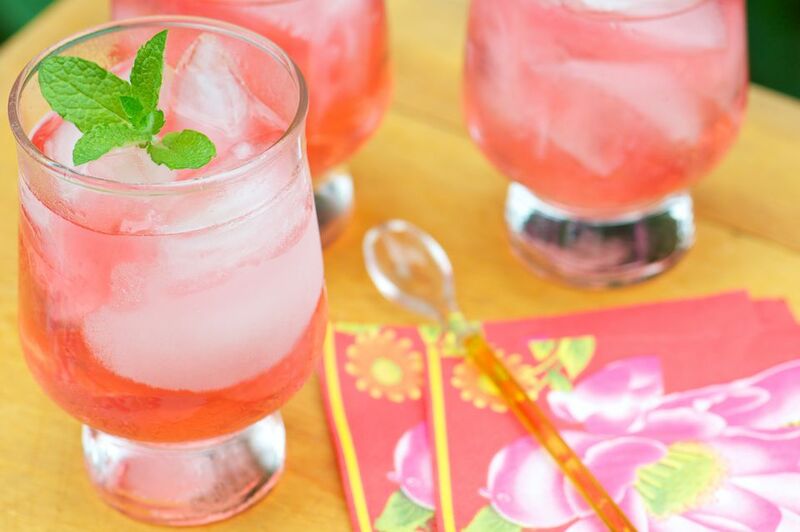 The raspberry press is a delightfully refreshing cocktail that is a wonderful option for happy hour, a late brunch, or a summer cookout. It is simple, fruity, and is a great way to show off your favorite raspberry vodka. The recipe is also a quick twist on a mixed drink known as the vodka press. This recipe was originally designed for the amazing flavors of Charbay Red Raspberry Vodka. You may still be able to find it, but the Napa Valley distillery is no longer producing that particular flavor. However, any premium raspberry vodka will do just fine accented by the recipe's two lightly flavored sodas. To prepare this drink you'll use the technique of rolling. Once you get the hang of pouring between glasses, you'll be able to do it with ease and won't spill a drop. Pour the vodka and sodas into an highball glass filled with ice. Roll the contents into a cocktail shaker or mixing glass to mix. Pour the drink back into the glass. If you're not comfortable with rolling drinks, feel free to stir the raspberry press in an ice-filled highball glass. You can make the drink as tall or short as you like. Simply pour more or less of the two sodas to suit your taste, making sure to keep the proportions equal. A splash of each creates a short, very flavorful drink that's actually a better fit for an old-fashioned glass (though that make rolling more difficult). Pouring 2 ounces of each soda is about perfect for a nicely balanced tall drink. How Strong Is a Raspberry Press? The strength of the raspberry press is going to depend on the bottling proof of the vodka and the amount of soda you choose to pour. For instance, with 80-proof vodka and 1 ounce of soda in total, the drink has an alcohol content in the 23 percent ABV (46 proof) range. With 4 ounces of soda, it will be much milder at 12 percent ABV (24 proof). What Is the Vodka Press? The vodka press is a semi-popular mixed drink that remains a little obscure. It certainly isn't ordered as often as a vodka tonic or vodka cranberry, but many people enjoy it because it's a nice, refreshing drink. Quite simply, the vodka press is a shot of vodka with both club soda and lemon-lime soda. It's made just like the raspberry press, but with clear vodka. The word "press" in the name may seem to indicate that you'll be pressing something with a muddler, but that is not the case. Instead, the vodka press takes its name from the popular whiskey highball known as the Presbyterian. It's also a double soda drink, though it typically uses ginger ale instead of Sprite or 7-Up. In keeping with the raspberry press theme, you can certainly pour any flavored vodka into your vodka press. The great variety of fruit vodkas available offer nearly endless possibilities and even non-fruit flavors can produce a tasty drink. Try a vanilla press made with vanilla vodka. The taste is similar to a vanilla cream soda, but with a drier profile. Mixed drinks like the Presbyterian and Vodka Press raise the question of why two sodas are poured rather than just one. The answer really comes down to balance. Club soda tends to have a dry profile because it's unsweetened. The majority of lemon-lime sodas are sweetened and some have more sugar than others. In general, though, they are certainly not as sugary as many colas or big-name sodas like Mountain Dew. By combining the two sodas in one drink, you get a nice hint of citrus and a touch of sweetness with double the carbonation. In the end, it's actually brilliant and it is one of the most refreshing soda highballs you can mix up. Mango Cocktail: a Taste of Paradise!